I have an optical train (Borg 101ED+QHY163M+Filterwheel) where I want to combine 3 filters stacked (WO VR1 + IDAS LPS-P2 + LRGBHSO Filters) and have doubts about which distance to use between them. I'm mainly concerned about internal reflections. What's better? To put them as close as possible? As far as possible? I would have them as far as possible. But I would question why would you use other filters, especially minus violet. With narrowband at least you need no other filter. And light pollution filter - maybe with L.
What is the function of WO VR1? Is not a apo telescope? In any case, normally, the filter the farther away from the sensor less reflections, but more vignetting. I use the VR1 beacuse I noticed bloated blue stars when I started to use the QHY163. Before, I shooted with DSLR without noticeable issues, so I suspect that this scopes are optimized mainly for DSLR imaging. 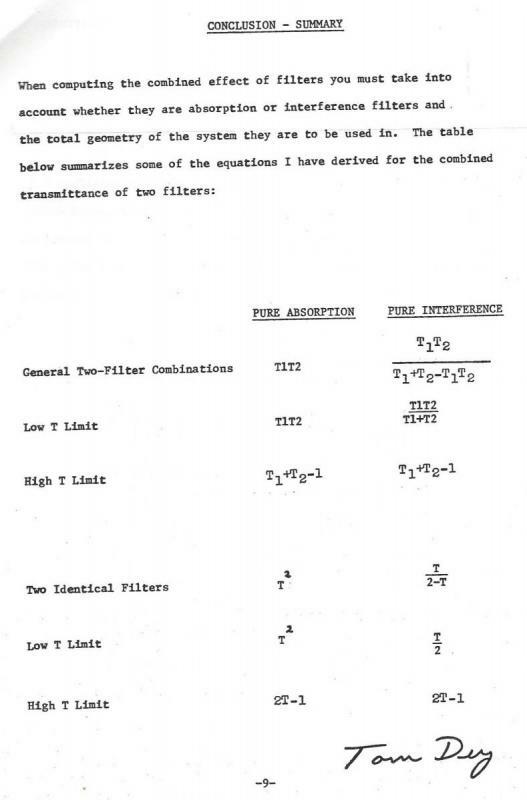 There are other threads in this forum that notice also that Borg scopes are not as well corrected in the full spectrum as a FSQ, for example, and I suspect that the QHY163, that is more sensitive in the blue spectrum, pushes the optics "out of the limits". I have read also that this effect can be mitigated with a Baader Fringe Killer, but before spending money on it, I checked my old stuff and found this filter. I have to perfom more tests, but seems to work well. Finally, I have a mechanical constrain that I have to deal with If I want to achieve the automatization that I have talked about. The Borg uses a helical focuser that has some free play, when unlocked and focused outwards. I have adjusted the drawtube to reach focus very inwards, so I'm interested in to keep the focus point as fixed as possible. That leads me to consider to let all the filters attatched even loosing some transmission efficiency, but as noticed in your last reply (Thank you Tomdey) I should make an in deep test to determine how much this stacking will degrade my images. TOMDEY - Cannot find Day's paper on the Internet; I am particularly interested in the closing discussion along with any other analysis sections. Can you point me somewhere? Hi, Bob. 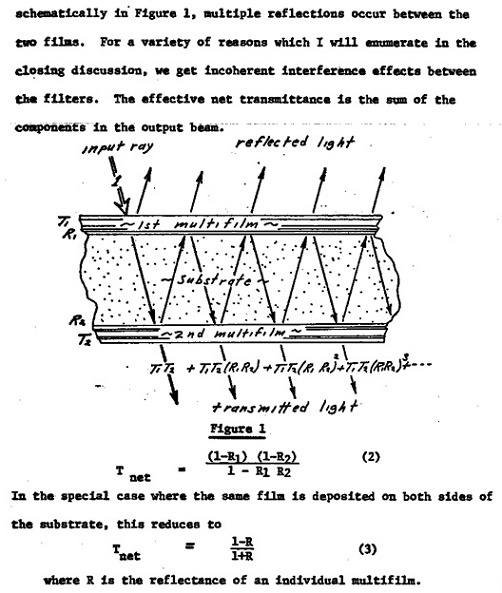 I did that short paper back around 1980-ish, when I was attached the Bausch & Lomb as a "Senior Research Scientist" ~Vacuum Coating Division~ and a member of the Vacuum Coating Society, now called the SVC. 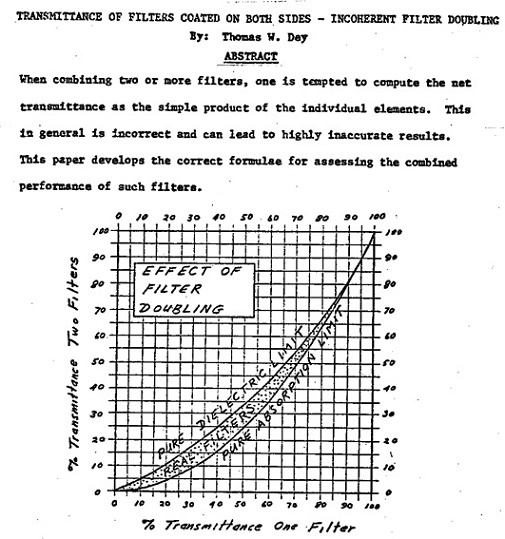 The greater context was dielectric multilayer interference filters, where I first introduced the concept of intentional phase-scrambling between coherent stacks... making for the most generalized ~optical thin films~ Previously, formulae and theory were almost entirely restricted to either simple metals, enhanced metals, and all-dielectric, entirely coherent stacks... but none further comprised the concept of intentional phase-scrambling in some (typically thick) layers. Note that the off-band rejection is not the T2 that the engineer (naively) assumed, but T/2... which is way more! I then strolled off, having analyzed and explained the situation. 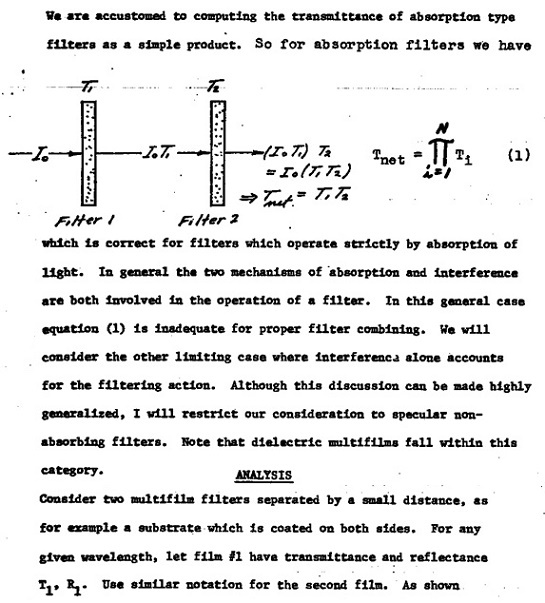 Back to my desk and immediately dove into deriving the most generalized case: film/filter stacks comprising arbitrarily many coherent, partially-coherent and incoherent layers, each with its own complex index of refraction etc. etc. Turns out the analysis is surprisingly easy, the most difficult parts already having been addressed by WWII-era antenna transmission-line designers and, of course, Feynman's ~sum over histories~ approach to QED. The partial-coherence added little difficulty... turns out that spinning Feynman's little vectors here and there, along the way, like a finite number of little roulette wheels... just added a few layers to the book-keeping. 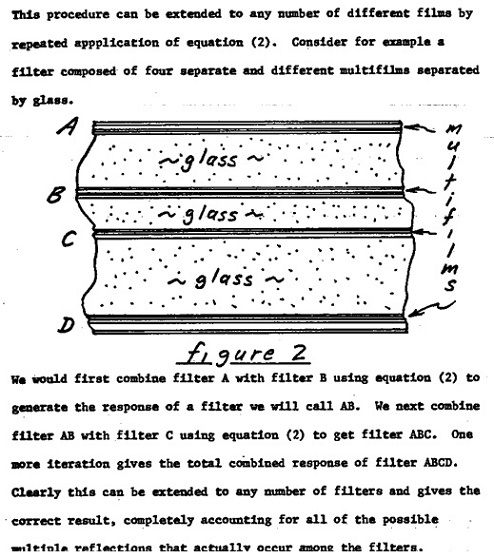 I did the math, wrote the numerical-analysis algorithm, coded it up in Fortran, punched and debugged and proceeded to design and build filters comprising the new concept. The predicted spectra pop out of the other end (running, back then, on the IBM-370 Mainframe). I don't know if commercially-available turn-key Thin Film Design Aps incorporate that stuff or not... probably not. We did indeed build products that use it, though. Mostly for lighting applications, where traditional Image-Forming Geometrical Optics also goes out the window! Non-Image-Forming then became my specialty! I hope that summary sheet is enough. The full-blown analysis was the topic of a much more ambitious paper, buried somewhere in thousands of pages of stuff. Tom-Very interesting. Thanks for the attached summary and your discussion of the events leading to the paper!